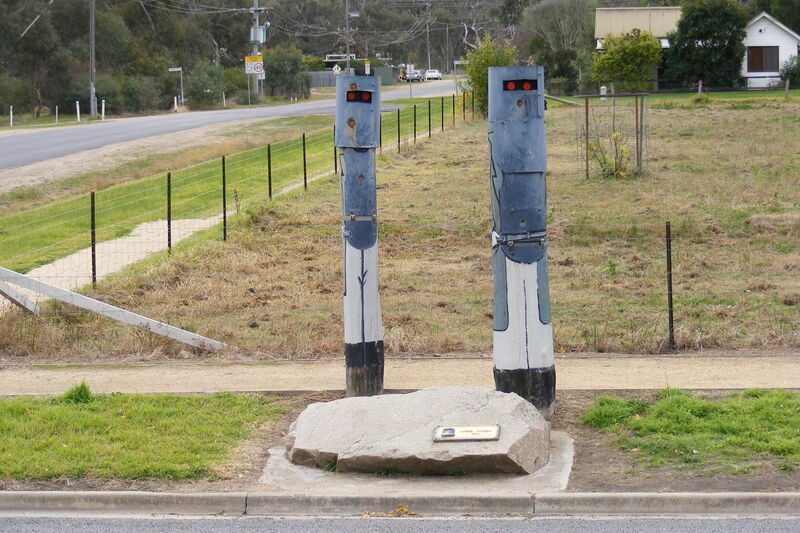 Glenrowan is a small town about a three-hour drive north of Melbourne, where the infamous Kelly Gang slugged it out with a contingent of police troopers on June 27, 1880. Ned Kelly was captured in his armour and helmet and went on to become one of Australia’s only folk heroes. For better or worse, Ned is the closest thing we’ve got to Davey Crockett or Robin Hood. To the right you can see what a fitting tribute Glenrowan offers its most famous son – a couple of ugly totem poles and a rock in front of a field with a pony and a bathtub full of water. Although there is an armless majesty about them, don’t you think? Further to the right of this timeless scene here is a sign which states proudly that it is a replica of the inn sign that used to be there [“Hey kids! Check it out – it’s just like the sign that was here back in 1880!”]. Further around the corner, of course, you can find Ned himself, fashioned out of a log and with a couple of extra logs for legs, propped up on another log and with some red paint to show that he has been shot. To be fair, Ned’s effigy is better than the troopers fared. They are like the unitard of totems, with just a single pole to represent arms, legs, body and other particulars. My partner’s step dad John [pictured left], who is from northern England, must have been wondering a bit about the colonials when he saw this lot. I’m not sure anything in this town suggests that Australians are ready to run their own country. 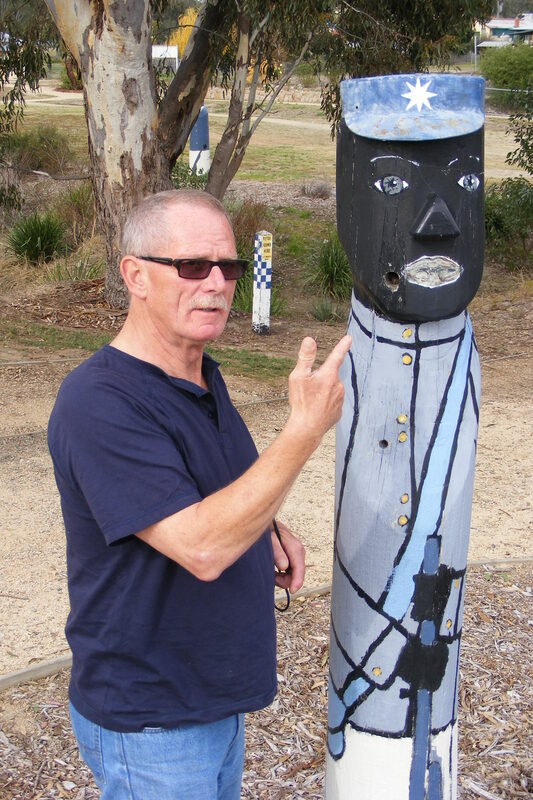 And given Glenrowan made it onto the Australian National Heritage List, you might think old Ned deserved something better. His myth does at least. Because the huge statue of Ned Kelly and the animatronics show in Glenrowan aren’t about to lure people away from the Sydney Opera House or the Gold Coast. But that’s also kind of why I really like what’s happened here. These totem poles would have had to be be proposed, ticked off and funded well before they were actually built – which means plenty of people in the local council thought they were a great idea. And I love that. As a tribute, it’s a bit raw, a bit rough, and a bit Aussie. It probably reflects how the locals want to remember their most famous export. And given this is Ned’s country, I can only imagine that he might have approved. So you can keep your pyramids and your stone henges as far as I’m concerned – I’ll take my history served like this every time. I really hope that when I go to find out what Davey Crockett got up to at the Alamo, it’s all laid out for me using totem poles.